Ethan Matthew Hunt’s third adventure is an explosive disappointment. In case there’s still any confusion, the Mission: Impossible movies aren’t really movies at all. They’re Tom Cruise vanity projects disguised as movies. The first installment was borderline insulting with its multiple uses of “lifelike” facemasks, allowing various characters to infiltrate plot-crucial locations by looking exactly like somebody else. Straining all credibility, director Brian de Palma was satisfied with a silly story that visited the Ben Cooper Costume Emporium about four or five times too many. While M:I-2, directed by John Woo, was more fun and had an artistic angle to its presentation, the creative geniuses behind the production once again dipped in the ol’ facemask trough. Now, M:I-3, with first-time feature film director J.J. Abrams at the helm, has turned out to be a massive miscalculation. Who’s J.J. Abrams? He created the TV shows Felicity, Alias, and Lost. That’s quite a 1-2-3 punch. Alas, here he’s grafted the worst elements of the first two M:I movies together with the more preposterous subplots of Alias: Season Two to create an alarmingly stupid movie. The feeble plot points from the weakest season of Alias include silly sci-fi body doubles and an all-thumbs handling of the conflicting emotions when romance meets the dangerous life of a secret agent. Now they’ve been blown up for the big screen. Tom, please make a pact with society that M:I-4 will not use that stale facemask device. It might work for Scooby-Doo and other 1960s TV shows, but it didn’t work in the first two M:I installments and it certainly doesn’t fly in the new millennium. In M:I-3, the story somewhat revolves around an $850 million thing-a-ma-bob called the “Rabbit’s Foot.” It’s what Owen Davian (Philip Seymour Hoffman, Capote) is attempting to sell to somebody, somewhere, and it’s what Ethan Hunt (Tom Cruise, Minority Report) needs to find somehow, some way. That’s pretty vague, but that’s what’s on the screen. It’s never made clear what the “Rabbit’s Foot” will really do, although, since it’s branded with the symbol for radioactive materials, it can be assumed it offers some degree of danger. Alfred Hitchcock would often use something he referred to as the “MacGuffin,” an item that serves as a distraction, a ruse to lead viewers down the wrong path. In this case, the Rabbit’s Foot may be considered a MacGuffin; it’s a throw-away plot device used by the writers in order to create a situation in which Ethan Hunt has to save his (brand-spanking-new) wife. Having left the Impossible Missions Force, Ethan wants to settle down and have a normal life. So, very early on, M:I-3 starts to feel like an episode of Alias, albeit a “very special episode” in which Sydney Bristow takes time off from the show for maternity leave, with Ethan Hunt subbing as the distressed secret agent in love. Abrams loads up the front end with those familiar scenes of bonding and snazzy parties with lots of pretty friends. Heck, there’s even a joke. You see, Ethan’s ingenious cover as a civilian is that he works for the Department of Transportation, studying traffic patterns. It’s the kind of chitchat that makes men snore and women swoon; a gaggle of girlfriends giggle over the awesome marriage material that is Ethan Hunt / Tom Cruise. The lucky lady is Julia (Michelle Monaghan, The Bourne Supremacy). She’s an RN and a nice woman of the earth. Tortured by his need to go on another mission, Ethan does what any man would do in the same situation. He marries Julia on the spot, in the hospital, and then they go to a stock room and boink. Taking another cue from his Alias series, Abrams starts M:I-3 with Ethan’s new wife at the wrong end of Owen’s gun. Then he flashes back to tell the story of how they got there. It’s supposed to be an exciting, dramatic way to start the movie, but it’s wrongheaded under the circumstances. It works well on Alias, but it doesn’t work here in what is a one-shot, standalone big screen romp. Doing so simply telegraphs the movie’s denouement, leaving no room for the tension to build. On the bright side, M:I-3 keeps the globetrotting spirit alive and, to that end, it’s at least fun to visit Vatican City and Shanghai again. On the down side, that trip to Vatican City also embodies everything that is wrong with the entire M:I franchise. In an attempt to kidnap Owen, Ethan does what has been done so many times before: he assumes his prey’s identity by using one of those lifelike facemasks. This mask is so magical it even transforms Cruise’s sofa-jumping, drug-free physique into the paunchy couch potato form of Hoffman. It’s stunningly precise, right down to Hoffman’s stockier legs. To be clear, Abrams is a very talented man and he has created three truly enjoyable TV shows. But in stepping up to the major leagues of theatrical films, he’ll need to bring a much better story with him next time. It’s appalling to think Abrams and Alex Kurtzman and Roberto Orci (two of his Alias co-writers) actually think the mask trick is in any way, shape or form compelling. That’s not to mention the voice duplication devices. With all that technology at hand, there’s no need to be clever. And M:I-3 is so not clever, it’s almost painful. The movie isn’t a total failure, though. 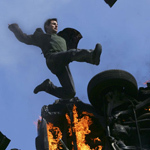 Some of the action scenes in Shanghai are truly spectacular, particularly those involving a jump from one tower to another in the high-tech financial district of eastern Shanghai. Those truly exciting scenes almost make the movie worth watching, but then the unspeakable happens. Since it is truly unspeakable, it’ll be written here. They pull out the ol’ mask trick yet again! Helping ease the pain of the lame duck storyline is a stellar cast. Laurence Fishburne (The Matrix) and Billy Crudup (Almost Famous) tango in another “a bad guy has infiltrated the impenetrable IMF” subplot. Just about the only somewhat-original aspect of this movie is that Crudup plays a clean-shaven man in a suit; at least that doesn’t seem to happen very often in Crudup’s career. There are also a couple familiar faces from Abrams’ other projects; most notable is Keri Russell (Felicity herself) as Lindsey Farris. Lindsey has the distinction of being the first agent trained by Ethan to actually receive his recommendation for active duty. As for Hoffman, he’s good. But he doesn’t get enough screen time to flaunt his ruthlessness; his role is surprisingly small. He yells, he points his gun at Ethan’s wife, and, most heinously, he and his thugs use a spiffy device to inject some kind of thingy up the nose of their victims. The doohickey somehow manages to get lodged in the back of the head, where it acts as some type of heart failure device. In order to deactivate it, the victim needs to be defibrillated; it’s kind of a dicey “you gotta kill me in order for me to live” predicament. It’s a good thing Ethan married a nurse.